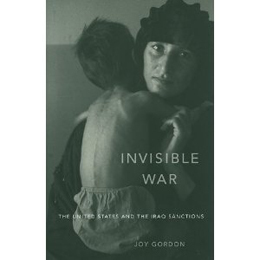 Joy Gordon has crafted a well researched and sobering story of the US-led failure of international governance in the case of the 13 years of sanctions on Iraq. The underlying argument made is that the UN Charter's mandate to achieve 'health, education and economic development' was fatally compromised by a US policy which was premised on 'an ongoing commitment to regime change'. As far as the US was concerned, sanctions were designed to topple the regime of Saddam Hussein by depriving the Iraqi state of an income that could lead to a military coup. Yet Saddam remained and what the sanctions did achieve was the relegation of Iraq to what one UN official described as 'a pre-industrial age'. The Security Council provided a fig leaf of legitimacy to sanctions that consistently 'prioritized disarmament over humanitarian concerns'. Effectively, Gordon argues that the result of UN involvement was to ensure the complicity of international governance in the 'legalization of atrocity'. Gordon places the evolution of the sanctions in the context of the 1990 invasion of Kuwait and of August 1990's UN Security Council Resolution number 661, which prohibited all UN member states from trading with Iraq. The subsequent 1991 war saw 130,000 tonnes of explosives dropped on Iraq causing $232bn-worth of damage, destroying 'electric generator plants, water purification & sewage treatment' plants, which resulted in epidemics of cholera and typhoid. The sanctions undermined the Iraqi state's ability to provide basic services, reducing their governmental budget by 90%. Nearly all imports were blocked, and this for a country which had previously imported 70% of its food and was dependent on imports for nearly every aspect of its economy and public services. The book speaks with a genuine and well informed anger. Gordon admits that her writing is a product of 'the shock and horror that most would feel in the face of such enormous and gratuitous human suffering'. Gordon has unearthed a treasure trove of well researched statistics to support her argument that by substituting 'regime change for what was legitimately mandated by the Security Council, the United States fundamentally compromised the legality of the sanctions and the legitimacy of the council'. The US desire for regime change was clear. In addition to the sanctions in 1991 the Bush administration authorized covert action to 'create the conditions for the removal of Saddam Hussein from power'. Throughout the 1990s the US spent over $100m to support insurrections and coup attempts, and was also found guilty of using UNSCOM to gather intelligence on the Iraqi regime. The 1998 US 'Iraq Liberation Act' simply made explicit what had been known by everyone else already. The people of Iraq were to pay the greatest price for these bungled attempts at regime change. The country descended from a 'first to forth world country' and hundreds of thousands of Iraqis died as a consequence, including 'at least 500,000 children under the age five who would not have died if there hadn't been sanctions, primarily from dysentery combined with malnutrition'. Sanctions also 'decimated the health of several million children', by 1997 one million children under five were malnourished and by 1998 70% of Iraqi women were anemic. Sanctions destroyed a whole economy and 'made a shambles of a nation's education and health care systems'. However as US Secretary of State Madeleine Albright famously said, the human price of the sanctions 'was worth it'. Gordon's book investigates the specifics of how sanctions were allowed to continue. Several tools of international statecraft were at fault; in the Security Council the US 'reverse veto' allowed 'a single permanent member to force the continuation of a policy, even after it is clear that the majority, including other permanent members, oppose it'. UN committee meetings were surrounded in secrecy, but ultimately the bottom line was that the US invocation of security concerns allowed them to block 'huge quantities of humanitarian goods'. US positions 'came to be determinative of Security Council policy'. Almost anything could be denied entry into Iraq including 'equipment and medicines for water treatment, transportation of food and other goods, refrigeration for medicine and blood supplies, and inputs for agriculture'. What was allowed in was subject to an arduous 'full tracking' system. The US constantly looked to worst-case scenarios in order to justify the blocks. 'Any security concern, however slight or speculative, overrode any humanitarian concern, however extensive and certain'. The imagination that people were willing to use was astounding; on one occasion it was decided to ban the import of chicken eggs as they could be used to grow viruses for biological weapons. Meanwhile, although the US House and Senate held dozens of hearings on Iraq over the course of a decade, 'almost none of them mentioned the humanitarian crises'. Gordon argues that the 'perversity and irony of the sanctions regime' is that 'it may have done more human damage than Saddam Hussein's persecution of ethnic groups and human rights violations combined'. Although not the focus of the book, Gordon explains that while 'the Iraqi government can legitimately be criticized for certain measures that significantly worsened the situation for the Iraqi people', the US was largely responsible for the results of the sanctions policy. However despite alluding to 'kickbacks on contracts, ongoing smuggling' and 'wasted money on prestige projects, such as palaces', Gordon's decision not to investigate further how Saddam's government adjusted and controlled a response to sanctions opens her work up to accusations of one-sidedness. Nevertheless, Gordon's important book is a cautionary tale of what happens to a state when the full mechanisms of international sanctions are placed upon it regardless of consequence. Gordon admits that US policy was not calculated to destroy the Iraqi population but rather was 'deeply indifferent' to the consequences of its actions. Arguably much of the story of the post-2003 occupation is a legacy of such consequences.